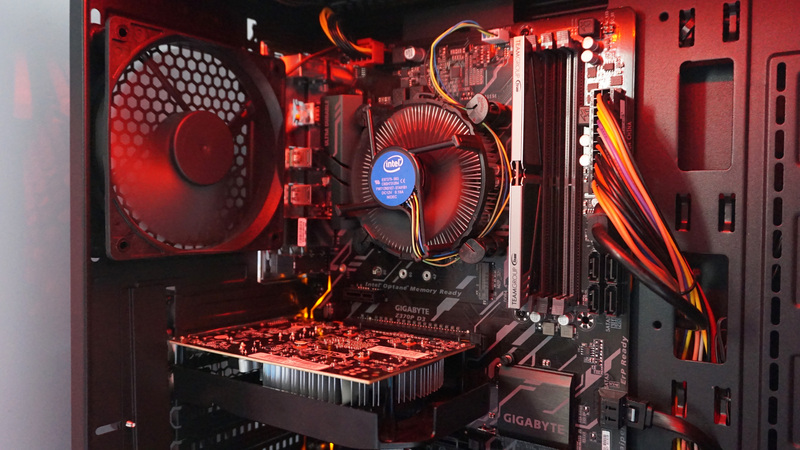 If the thought of building your own PC fills you with dread, then buying one pre-built can save you a lot of time and hassle. You don’t even have to spend that much to get a good one, either, as this £600 Kinetic Z1 from UK system builder Overclockers UK is perfectly tuned for 1080p gaming straight out of the box. I’ve got the basic spec on test today (more on what that entails in a sec), but it’s also fully-configurable depending on what you want from it, giving you the option of everything from an Intel Core i3 right up to a Core i7, an Nvidia GeForce GTX 1050Ti up to an Nvidia GeForce GTX 1080, plus plenty of extra storage, case, Wi-Fi and lighting options to suit your budget. Let’s take a look. As mentioned above, I’m testing the cheapest £600 specification of the Kinetic Z1, which comprises of a quad-core 3.6GHz Intel Core i3-8100 processor, 8GB of RAM, an Nvidia GeForce GTX 1050Ti and a 1TB SSHD hybrid drive, all wrapped up inside a Kolink Stronghold Mini Tower case that has a single, tempered glass panel on the side as well as a single strip of red LED lighting. Before we get into its performance, I have to say the Kolink case is certainly one of the better-looking towers I’ve seen in a while, and I greatly prefer it to my own Corsair Carbide 270R Midi tower. 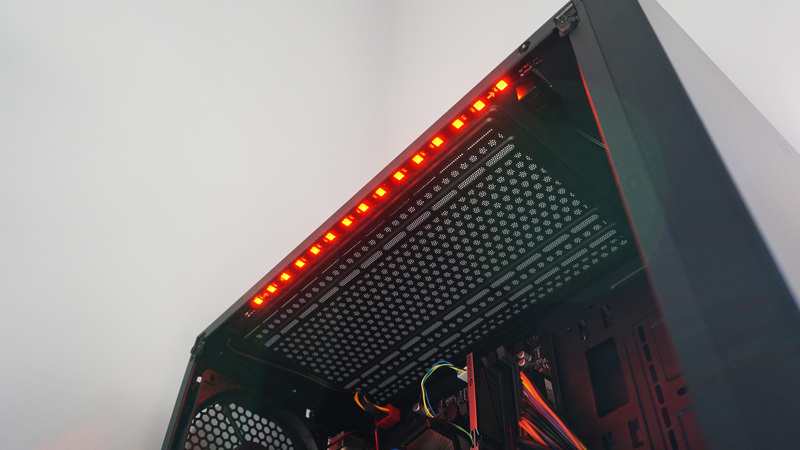 The glass side panel not only lets you peer in and admire Overclockers’ neat cabling handiwork, but its power button and front-panel are also much more conveniently located on the top of the case rather than the side like the Corsair, giving you just that extra bit of flexibility when it comes to positioning your PC when you get it home. The entry-level Kinetic Z1 spec comes with just one stick of RAM (8GB) and a stock Intel cooler, but almost everything is fully-configurable. 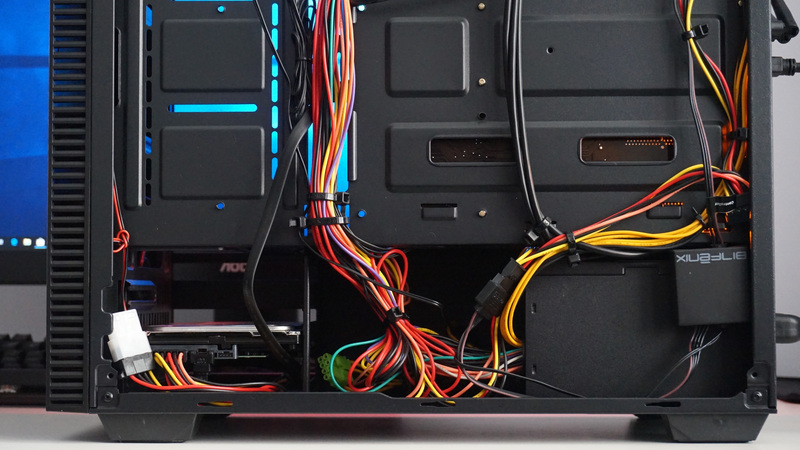 With no storage bays getting in the way of things either (the SSHD is nestled down the bottom of the case inside the PSU cage), there’s plenty of room for building and adding extra bits later, too, whether that’s a larger-sized graphics card or additional cooling if you feel up to it. Equally, however, that does mean there aren’t any extra mounts or bays to add additional storage drives, so I’d recommend kitting it out with as much storage as you think you’re going to need from the outset, as it may be tricky to add more later on depending on your building skills. I’d also urge you to opt for something fancier than the basic 1TB Seagate FireCuda SSHD, ideally the excellent Samsung 860 Evo SSD as your primary drive and your choice of HDD as a secondary drive for storing games on. For despite being a hybrid drive that has a teensy bit of solid-state storage built into it, my tests showed the default Seagate is still achingly slow at reading and writing small files, producing speeds of just 0.65MB/s read, and 1.27MB/s write in AS SSD’s 1GB Random 4K test. The Samsung 860 Evo, on the other hand, will bump that up to a much nippier 40MB/s read and 98MB/s write, along with the added benefits of faster boot times and Windows generally feeling a lot more responsive. Unless you fancy buying additional storage mounts, you’re better off getting as much storage as possible when you buy. But enough about the case and the storage. What about the Kinetic Z1’s gaming performance? Coupled with a quad-core Core i3-8100, Palit’s 4GB Storm X edition of the Nvidia GeForce GTX 1050Ti makes for an excellent 1920×1080 gaming machine. It’s not going to blow you away with 60fps on the very highest settings at this resolution – especially on some of today’s more demanding blockbusters – but I still managed a very acceptable 60fps on Medium to High settings in most cases, and even a bit of smooth 2560×1440 gaming as well toward the lower end of the quality scale. Doom, for instance, ran quite happily at 2560×1440 on Ultra, the frame rate sitting comfortably between 45-60fps as I kneecapped demons in the face. Indeed, I only had to knock the quality settings down to High at 1440p to push that lower boundary into the low 50s. At 1920×1080 on Ultra settings, the Kinetic Z1 was absolutely laughing, zooming around at roughly 72-94fps. The same goes for the lovely Forza Horizon 4, whose well-greased internal benchmark wheels roared up to an excellent average of 51fps on High at 1440p, and an even silkier 55fps average on Medium. Down at 1920×1080, Ultra was a little more taxing, with the frame rate settling on a still highly playable average of 45fps, but those after a perfect 60fps needn’t look any further than High, as this averaged out at a super smooth 68fps. Not all games will run this well at 1440p, but as long as you don’t mind putting up with Low quality settings at this resolution, the Kinetic Z1 is perfectly capable of hitting some very decent frame rates. In Hitman, it managed an excellent average of 58fps on Low at 1440p, and you could probably get away with tweaking some of settings to make it look even prettier without damaging its overall performance. If you’d rather skulk around with Agent 47 looking his best, however, then you can expect to see a very respectable 47fps average with everything whacked up to Ultra at 1920×1080, and turning off the SSAO and dropping a few settings down to High can push that even further to a silky 53fps. The Gigabyte Z370P-D3 motherboard comes with a decent selection of ports, but nothing especially fancy like USB-C. Most games, however, were happiest on Medium settings at 1920×1080. In Assassin’s Creed Odyssey, the game’s internal benchmark produced an average of 50fps on Medium at 1080p (albeit with a couple of major stutters down to just 13fps), but I reckon you’d probably be happy enough on High with its average of 42fps. There’s even scope for 1440p play on Low here, as long as you’re fine with a similar average of 41fps. The Witcher III: The Wild Hunt also showed the best results on Medium, with Geralt and Roach dashing across fields of White Orchard at a smooth 57-70fps. High, meanwhile, saw a high of around 50fps with lows of 36fps, but most of the time it settled around the 45fps mark – which, again, is perfectly playable if you fancier some prettier effects. Shadow of the Tomb Raider and Total War: Warhammer II took a little more wrangling to get into shape, the former averaging around 45fps on Medium with SMAA anti-aliasing at 1080p and the latter 49.2fps on Medium at the same resolution, but switching down to Low definitely produced the best results. Here, both games got much closer to 60fps, with Total War even going as high as 65fps. The only game it really struggled to do much with in my testing suite was Final Fantasy XV. Here, the game’s Average quality setting with all Nvidia effects disabled were about as much as the Kinetic Z1 could handle, with the frame rate running between 30-40fps. That’s still more than acceptable in my books, but needless to say those who really like Final Fantasy XV should probably consider getting a slightly more powerful PC. LED strips are an entirely optional extra. The quad-core 3.6GHz Core i3-8100 packs a surprising punch as well. While I can’t say yet how it compares to Intel’s recently-announced 9th Gen Coffee Lake desktop CPUs, the Kinetic Z1’s combination of a Core i3-8100 and 8GB of RAM shows pretty comparable performance to the Intel 7th Gen Core i5-7400 I tested in the Zotac MEK1. In Cinebench R15, for instance, the Core i3 managed a single core result of 145 and a multicore result of 585, putting it pretty much neck-and-neck with the Core i5-7400 on the former and just slightly ahead on the latter. The same was largely true when I compared it to last year’s AMD Ryzen 5 1400, too, which I tested on the Zotac Zbox Magnus mini PC. The Ryzen still has the edge on multicore performance with its result of 683, but when you look at what this year’s Ryzen 5 2600 can do by comparison (which scored 1247 in the same test), a difference of roughly 100 points is hardly the kind of appreciable difference that you’re going to notice regularly on a daily basis. Likewise, it was the Core i3 that pulled ahead in the single core test, which is pretty impressive for such a low-powered chip. You will, of course, get even better everyday performance by opting for a more powerful CPU on the Kinetic Z1, such as a Core i5, but in my books the Core i3-8100 should be more than enough for both gaming and daily computing tasks alike, especially if you’re looking to keep costs as low as possible. Whereas once a Core i3 wasn’t really worth considering as a gaming CPU, Intel’s decision to bump its core count up to four for its 8th Gen Coffee Lake chips instead of keeping it stuck at two has really turned its fate around since its introduction last year, so you needn’t worry about crippling your PC’s performance by opting for a ‘lesser’ processor. You’ll find the power button on top of the PC, along with one USB3 port, two USB2s and separate headphone and microphone jacks. 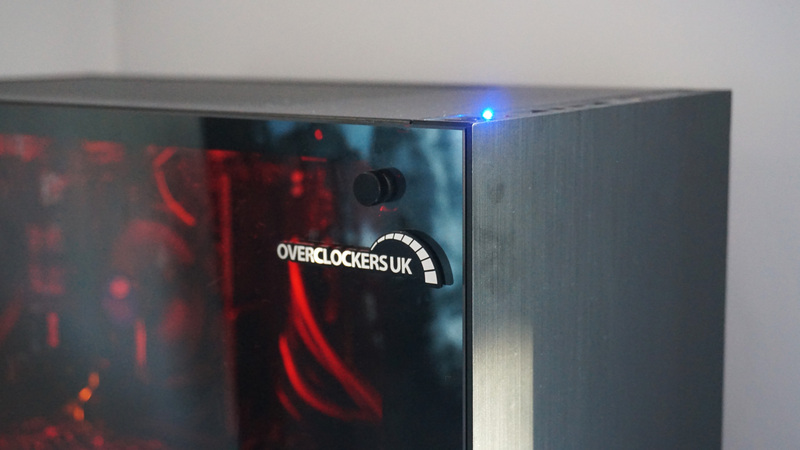 In all, the Overclockers Kinetic Z1 is a fine budget PC, particularly the £600 entry-level spec. Over at Scan, you’re looking at spending another £300 on their equivalent Core i3 GTX 1050Ti configuration, while PC Specialist’s version is closer to £700, making this one from OCUK great value for money. 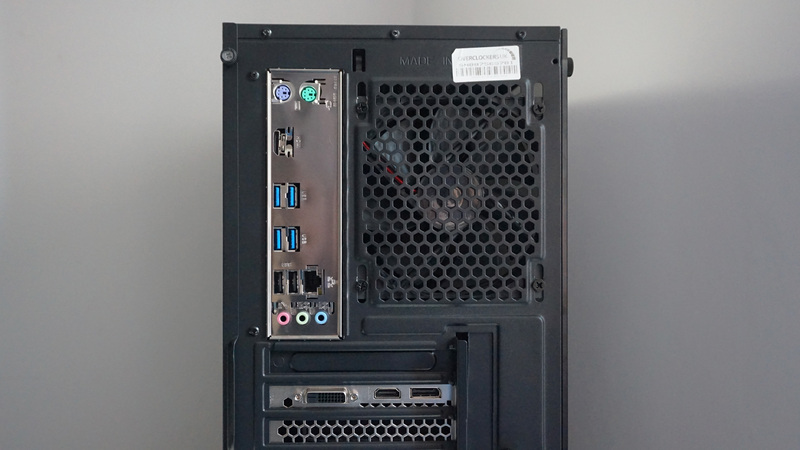 I realise this won’t be much use to those of you reading this in the US, but at least it should give you a good idea of what to expect from this kind of build. If you can find a similar specification for a similar sort of price ($800), you’ll be laughing. There are a few things I’d change, for sure (*cough*storage*cough*), but this is still a brilliant budget PC that definitely should be high on your list as a great value 1080p gaming machine. Tagged with desktops, feature, Hardware, Intel, Nvidia, Overclockers UK.